Scott Adams, creator of the great comic strip Dilbert, is sort of a prick. He is a horrible boss, and recently penned a charming misogynist rant comparing women to children begging for candy. Now we learn he likes to bash critics on message boards under a pseudonym. 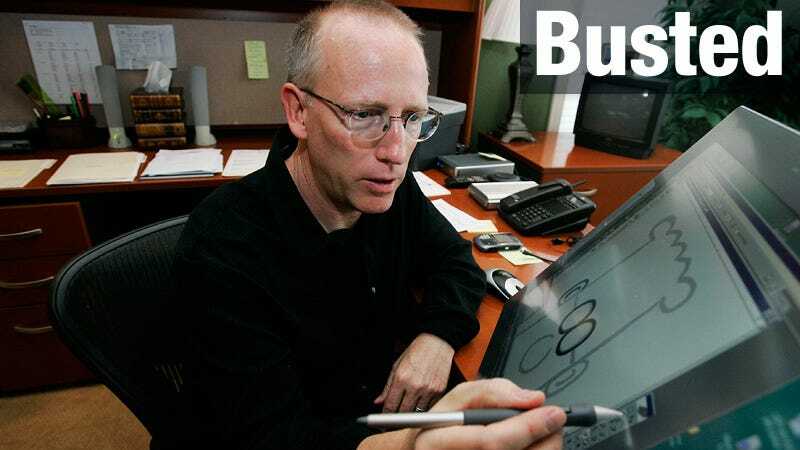 Is Dilbert&apos;s Scott Adams The Worst Boss In the World? For months, Adams has been pretending to be the world's biggest Scott Adams fan under the handle "PlannedChaos." (Planned Chaos is a book by Austrian economist and libertarian hero Ludwig von Mises.) Today, he fessed up to his sockpuppetry. It started with a thread on link-sharing community MetaFilter about Adams' Wall Street Journal op-ed on how awesome and successful he is even though he didn't get straight-As in school. Some people said mean things about the article, suggesting Scott Adams wrote like someone who has "actually convinced himself… that he's the smartest guy in the room." As far as Adams' ego goes, maybe you don't understand what a writer does for a living. No one writes unless he believes that what he writes will be interesting to someone. Everyone on this page is talking about him, researching him, and obsessing about him. His job is to be interesting, not loved. As someone mentioned, he has a certified genius I.Q., and that's hard to hide. I assume you don't hate all self-promoters, such as homeless people applying for jobs. Is it Adams' enormous success at self-promotion that makes you jealous and angry? After a number of MetaFilter users called him out today, Adams confessed, "I am Scott Adams." Then he said goodbye: "I'm sorry I peed in your cesspool." Metafilter users are currently engaging in a ritualistic shaming: "This is a wonderful example of how to take a garden-variety fail like a slightly dumb WSJ OpEd and turn it into an epic fail," wrote Lodurr. Adams also confirmed that he was PlannedChaos to MetaFilter founder Matt Haughey, who has this to say when we contacted him: "Our policy is that identity in the community is really important and we don't like people duping the entire userbase." Nothing like a supremely self-satisfied dolt making a fool of himself by posting fake stuff on the Internet. There's actually a funny Dilbert strip about this sort of thing.